Mark Angel believes that, in order to win Boxing Day’s derby clash at Sleaford Town, his Poachers squad will have to leave their Christmas spirits well and truly in the bottle. The Boston Town boss knows all about the sacrifices needed to pick up valuable points over the festive period. 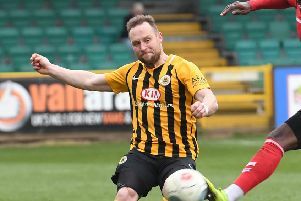 As a Boston United winger, he reported for training at the Danny Flear pitch with the rest of the squad on December 25 back in 2002 to blow out the cobwebs with a four-mile run. “I remember one Christmas Day, me Paul Bastock, Matty Hocking and the others went training at Freiston on Christmas Day,” Angel reflected. Indeed, Neil Thompson’s Scrooge spirit paid off as the Pilgrims claimed a 3-0 Boxing Day victory over his former club York City, with Stuart Douglas bagging a brace and Richard Logan also on target. United and York City may not have been the biggest festive rivalry going, but the Greens versus the Poachers will definitely not be lacking in Yellowbelly rivalry (KO 2pm). “Boxing Day matches are always ones to look forward to,” Angel added, before making a minor confession he hopes won’t rub off on his squad. “But now I’m manager and not playing I may let myself have a couple of pints the day before. “It’s a derby game against Sleaford, and we’ll go there wanting to win. “But that’s the thing about this league, everyone is capable of beating everyone else. “The only stand-out team I’ve seen so far are Leicester Nirvana, who are top. Town’s UCL Premier clash at Eynesbury Rovers was postponed this weekend due to floodlight problems. The Poachers’ next fixture at the DWB Stadium will be on Monday, December 28 against Lincolnshire derby rivals Deeping Rangers.